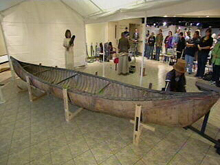 Maliseet First Nation members participate in a ceremony as a six-metre cargo canoe, built in New Brunswick in the 1820s, is put on display in the province for the first time. 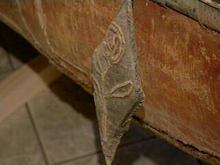 The hand-sewn buoys on the canoe feature a fiddlehead motif that is still used by First Nation canoe-builders in the province today. Widely known as "the grandfather canoe," it is believed to be among the oldest surviving birchbark canoes in the world. "This is the oldest and one of the largest Maliseet cargo canoes I have ever seen," said Stephen Augustine, curator of Maritimes ethnology at the Canadian Museum of Civilization. The ownership of the Canoe is presently held by the National University of Ireland in Galway. The Maliseet First Nation is negotiating with the University to have it returned to its custody. There are only two First Nations in the Maritimes, Maliseet and Mi'kmaq, not 29. The Maliseet First Nation has six Maritime Communities, and one in Maine; the Mi'kmaq First Nation has 23 Maritime Communities, and five in other jurisdictions: Newfoundland (1) Quebec (3) Maine (1) These communities, with the exception of the two in Maine, have been organized into Bands under Section 2 of the Indian Act. The two Maine communities have been recognized by the United States government. To refer to each First Nation community as a First Nation is incorrect, it only serves the best interests of Canada. Canada tried to fortify this usage by ignoring First Nation affiliation by placing them under an Aboriginal label under this now defunct address: http://www.ainc-inac.gc.ca/at/mp/mp_e.html. All Bands were listed without regard to First Nation affiliation, and the Website header stated "Atlantic Region Aboriginal Communities." One wonders why the header didn't read "Atlantic Region First Nation Communities." The government has now changed this (2009), and it now list each First Nation Community outside the Aboriginal label. I believe the reason for the way they had originally listed First Nations under the Aboriginal heading is that the Canadian government is fundamentally opposed to seeing the country's First Nations reconstituted as they existed prior to it using Section 2 of the Indian Act to fragmentize them. I'll use the Mi'kmaq First Nation fragmentation experience as an example of how the government accomplished the deed. Up until the mid 1950s, the time when the bands in the Maritimes were organized under the Indian Act, as per the provisions of Section 2, the Mi'kmaq enjoyed free movement to any Mi'kmaq First Nation Communities they selected. For instance, (fictional) if John Paul's family wanted to move from Burnt Church to Shubenacadie, or any other Mi'kmaq First Nation community, they simply did so. Because of this, there was a sense of community among the Mi'kmaq, our people considered themselves members of one big family. However, after the Mi'kmaq Bands were organized under the Indian Act, this ideal situation changed drastically. The Canadian government used Section 2 to divide and conquer. It did so by putting up artificial walls around each Mi'kmaq First Nation community by legislation, which made them into separate independent units. Now, if John Paul's family wants to move from Burnt Church to another Mi'kmaq community, the family must first apply for membership in that community. If the council of the community to which they want to move refuses their application they can't move. Incredibly, there doesn’t have to be a reason for refusal, it could be for any reason, or no reason, and there is no appeal. The procedure is so stringent that in many cases it's worst than the troubles that a Canadian citizen would encounter trying to migrate to the United States, or an American trying to migrate to Canada. Why the barriers? It is truly strange that a First Nation person, who wants to move to another community within his/her First Nation, has to surmount legal barriers erected by the Canadian government before he/she can do so. It becomes mind boggling when one takes into consideration that such restrictions on movement of people between communities within their own Nation are only found in police States. However, it should be noted that in such States the State applies the restriction upon it's own people, not upon people in another jurisdiction. This situation is discrimination at its worst because it only applies to First Nations Peoples in a society where otherwise free movement is permitted. The truth of this is witnessed by the fact that Canadian citizens living in any Canadian province can move to another Canadian province without encountering any legal restriction. Ditto for American citizens, they can move from state to state without legal barriers. But the Mi'kmaq, and other First Nation Peoples across this country, are barred by Canadian law from doing so within their respective First Nation communities. A repulsive violation of the human rights of Canada's First Nation citizens by the country's politicians. The time has come for Canada's First Nation People to demand that Canada remove the artificial divisions it legislated to fragmentize First Nations. Then, each First Nation can reunite. However, I should mention, that among the biggest fears that both Canada and the United States have is Tribal reorganization. It would lead to each united First Nation speaking with a truly united voice when demanding justice and respect for our human, Aboriginal and Treaty Rights, instead of the 600 plus fragmented whispers we use at present. (a) in the case of a band to which section 74 applies, the council established pursuant to that section [Indian Act election and Band Council procedural sections]. (b) in the case of a band to which section 74 does not apply, the council chosen according to the custom of the band, or, where there is no council, the chief of the band chosen according to the custom of the band. Fredericton city council is supporting a man's campaign to change the name of Savage Island to something inoffensive to local First Nations people. Percy Sacobie is leading the push to rename the small island in the St. John River about seven kilometres west of Fredericton. In a letter he sent to the Fredericton city council, which was endorsed by six Maliseet chiefs, he argued that the island be called Eqpahak, which he said means "at the head of tide on river or inlet." "The name savage is degrading and offensive and in this day of age, as in the past, such ethnocentric views should not be used or tolerated to describe a people or a place," Sacobie's letter said. "The name Eqpahak Island would be [a] more appropriate name to describe this island." Although the island is not within Fredericton's city limits, Fredericton Mayor Brad Woodside is backing Sacobie's fight to change the island's name. "I think it's important to note that I did meet with this gentleman, and asked the question — and I'm sure other people would ask the same question — on whether or not that name had any historical significance with respect to a family with the name of Savage, and I have been assured that's not the case," Woodside said.